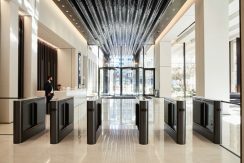 PRODUCT: EasyGate SPD-G SECTOR: Grade A Office CLIENT: 2 London Wall Place LOCATION: London London Wall Place is a new office development offering high quality Grade A office facilities to the City of London. The scheme comprises an acre of landscaped public realm set between two statement office buildings totalling 500,000 Sq Ft. Within the development lie the remains of St Alphage Church and a section of the original London Wall, which have been combined with new pedestrian routes and landscaped gardens to create a stunning destination. 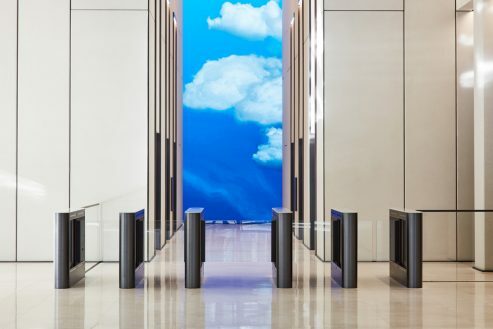 The buildings of London Wall Place have been fitted with a unique cladding that reinterprets the knapped flint of the site’s Roman and Saxon remains, beautifully combining historic and modern elements of the city. 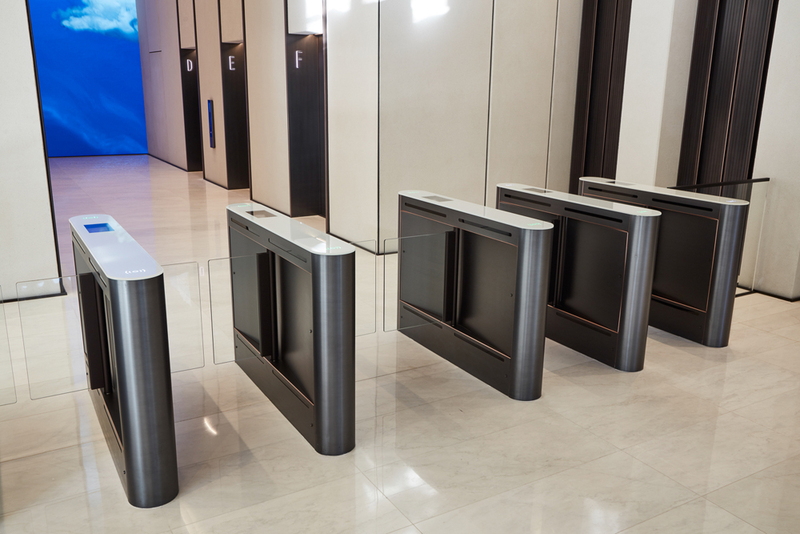 For the reception area of 2 London Wall Place a unique anti-tailgating solution was required to ensure only authorised staff or visitors could access the building’s facilities. 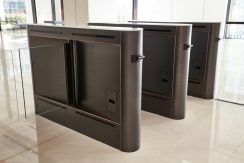 Due to Meesons expertise at delivering bespoke anti-tailgating products they were approached by Make Architects to deliver a unique Speed Gate solution. 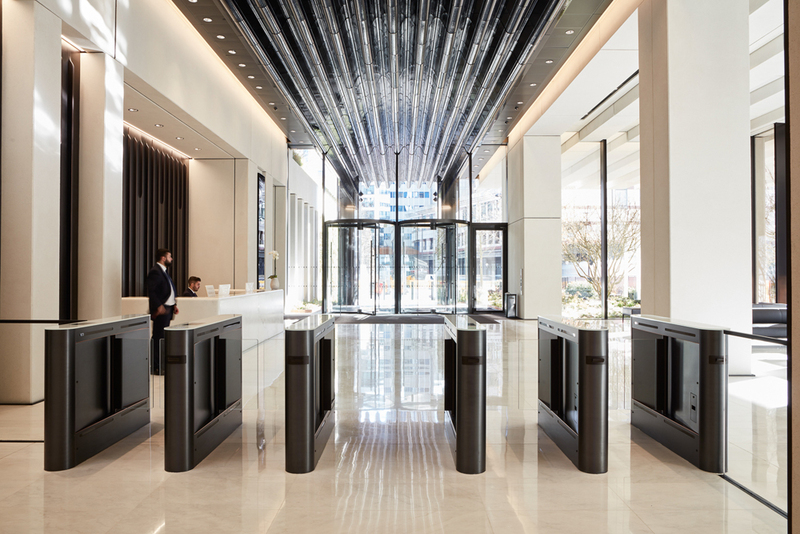 In keeping with the building’s design, the client wanted to create a bespoke reception lobby that would provide a welcoming environment for both visitors and staff. 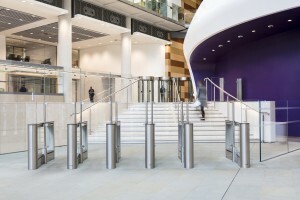 The client specified a UK based manufacturer to provide the distinctive Speed Gate finish, working with Evans Turner, Meesons delivered five unique lanes of EasyGate SPD-G Speed Gates. 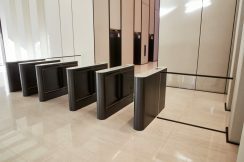 The Speed Gates with solid side infill panels were finished in copper bronze to match the finish of the lifts and reception panelling, with a white glass top lid to complement the Formigari stone reception desk, reception flooring and lift lobby. 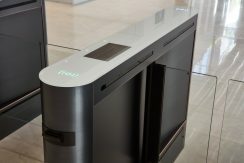 With high throughput required on a daily basis to cope with the number of staff and visitors, Meesons supplied Speed Gates with the latest MDD motor technology. 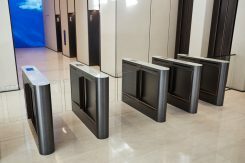 The quick opening and closing speeds of the EasyGate SPD-G glass barriers enabled an increased number of transits per minute. The silent and smooth MDD motor ensured any operational noise from the Speed Gates was kept to a minimum. 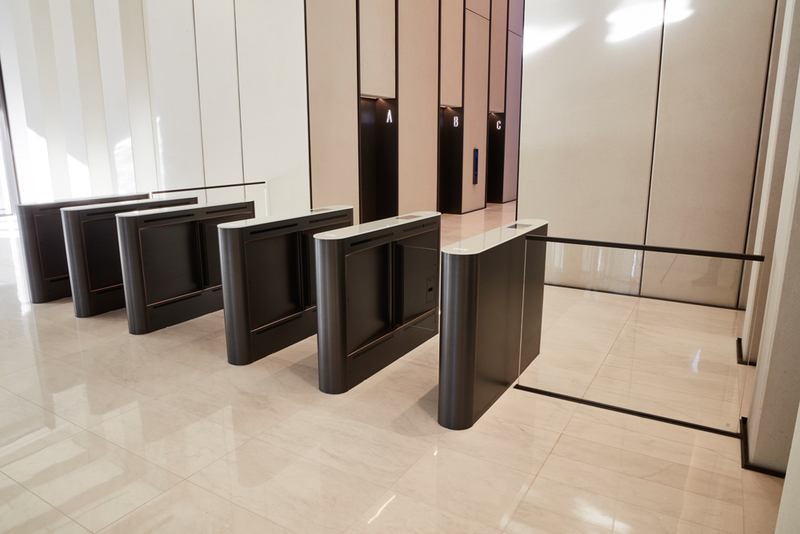 To alleviate overcrowding in the lift lobby, particularly during peak times, lift call control was integrated and recessed into five of the Speed Gate cabinets below the glass cabinet top lid, to help smoothly manage the flow of users through the building and reduce congestion. Due to the anticipated high numbers of visitors to the building, visitor card collectors were integrated into five of the Speed Gate cabinets, each with a capacity of 150 cards, making it easier to manage the collection of visitor’s cards upon exit. To maintain the aesthetics of the Speed Gates, copper bronze hinge capping was used to hide any fixings between the glass wings and Speed Gate cabinet. Transparent low iron glass wings and glass top lids completed the clean, modern design of the Speed Gates.